How your cabinetry looks like can make or break or your kitchen. Painted cabinetry is all the rage these days but what design to go for, colour scheme to choose, and layout to install is often not easy to decide on. In today’s post, we aim to help you pick a cabinet colour combination that will suit your aesthetic style, be it painted on Ikea cabinets or custom-made ones. There is no need to break the bank purchasing new cabinets or replacing your whole line-up. 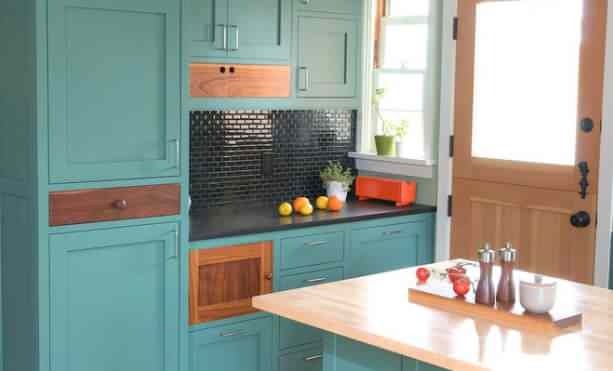 With the colour palettes below, even old cabinets can look fantastic! If you’re looking for a modern look but don’t want it to seem cold and sterile, this is a safe bet. The combination creates a cheery kitchen atmosphere that’s bound to look great on modern kitchens. The bamboo can invoke a zen-like feel too, great for open kitchens! Black painted cabinets are often seen as daring and sophisticated. You can get that look and keep everything clean, warm, and crisp by pairing it with a warm Brazilian walnut floor and porcelain tiles in shades of cream or steel. A warm oak floor in the shade honey-stained contrasts well with turquoise and complemented by shades of light sage green. Adding black accessories and appliances can complete the look of a fun yet still traditional kitchen. Want a modern rustic feel with a bit of a sultry vibe? Go for dark red, a muted olive green, and throw in lots of reclaimed wood. Bonus points is the fact that red stimulates appetite, so now you know why red sauces always makes you feel hungrier! Think red is too risky? Consider adding it only to some cabinets, perhaps to paint the kitchen island’s base, or as a primary colour in artwork. A white kitchen comes to life with cherry-stained oak floors, stainless steel appliances, and a splash of lemon or pale yellow for the cabinets. Best for kitchens with not much natural light as the colours can simulate sunlight. If you want it bold and feminine, go for this route. Use the colours sparingly though, especially the hot pink. Carbonized vertical grain bamboo floor ties up everything in this colour scheme. Green cabinets in celadon and pear shades are very trendy right now and it won’t cost you much to have them in your kitchen when all it takes is a coat of paint. Best if you have mostly stainless steel appliances but when done correctly, can also work with black as well. Love gray? If you have a neutral floor like a hickory one in a shade like honey spice, you can certainly paint your cabinets whatever shade of gray you like. The combination is extremely neutral but still modern, a nice and safe departure from an all-white kitchen. For depth, use different shades of gray. Loving how the kitchen cabinets look above? You’d enjoy them even more in your dream home! Shop for a new home in Oakville this year and see what makes Oakville such a special community this side of Toronto. Contact us to schedule a viewing!